Silver rings have a loyal following and many true silver jewelry lovers adore the timeless appeal of 925 sterling silver. It is very true that a ring with an antique design concept is best, crafted in sterling silver. The experienced artisans at Kai Silver bring to life some of the most amazing, modern and antique style jewels rendered in gold and silver. The RG-DS silver ring replicates one of the earliest renditions of the 'three stone ring'. Since all our jewelry is completely custom made, it is possible to accommodate all requests related to gems, design and dimensions. Great effort has been made to retain the classic antique look of the design. Good metal weight and an ethnic appearance are just some of the excellent features of this custom 925 silver ring. Each jewel crafted by us complements the refined tastes and unique style of our clients. The dimensions for this antique silver ring, are neither too big nor too tiny and insignificant. An 8x6mm oval diffused sapphire gem adorns the center of the ring, on either side is a immaculately cut 7x5mm white topaz pear shaped gem. Since no effort has been made to compromise on the metal weight, the jewel boasts of a healthy 4mm width even on the portion behind the finger. While we did mention that the antique ring has diffused star sapphire and white topaz gems, you can order the same silver or gold ring with gems of your choice. This ring was originally crafted for a wonderful Italian lady, she attached special importance to star sapphire and white topaz, no attempt was therefore made to showcase other gem colors in the ring. 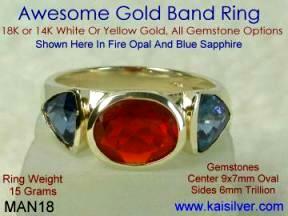 Kaisilver with an unmatched reach and network for gemstone procurement, places no limitation on the selection of gems. You could therefore order your silver antique ring with gems selected by belief and tradition, color preference or as birthstones. The three stone ring concept is often used to create a 'family birthstone' ring. With this concept, each of the three gems represents a member of the family - and you can pick just about any combination of gems for your antique 925 silver ring. Mothers rings are also often represented by three gemstone rings with, the center gemstone symbolizing the mother's birth stone. The side stones could symbolize the birthstones of the children. When ordering this antique style ring, do not be limited by the gems listed or shown on our website. We will gladly procure and custom cut any gem from any part of the world for you. There is no doubt that sterling silver best depicts the antique aura of classic jewels but, there are many jewelry lovers who wish to see these concepts executed in gold too. We can craft your antique gold ring in 14k or 18k gold, the options and pricing for 10k gold rings can be provided on request. Most historians would agree that, much of the truly antique jewelry found during our times is made from silver, bronze or copper. Gold was always precious and expensive and generally affordable, only to the rich and powerful. Theft, melting and the remaking of gold ornaments is likely to have been the reason for their disappearance. Besides the gold karat options, your antique gold ring can also be crafted in three gold colors namely, white, yellow and pink. Ideally we would recommend that the RG150-DS antique style 925 silver ring be left un-plated. A bit of tarnish on the silver ring would enhance the timeless element of the jewel. And if you wish to plate your ring, there is something that you should know. Any plating done on 925 silver jewelry will not last forever, it will wear off after some wear and tear. But if you still prefer to have the ring plated, we provide options for white rhodium, yellow gold and rose gold - add another 25 U.S$ to the prices in the table if, you decide to go for the plating. Fine craftsmanship, custom cut gems for the gold and silver antique ring. The silver antique ring can be ordered with or without plating. 14k and 18k white, yellow and pink gold can be selected. For 10k gold, please request for a specific price quote from our support team. Center gem is an 8x6mm oval stone, side gems are 7x5mm pear shaped. The gold ring has a weight of around 15 to 18 grams. The 925 silver ring weighs around 12 to 15 grams. No limit is placed on gem selection, all gem combinations are possible. The portion behind the finger has a width of 4mm, this can be customized. You can also request for different gem sizes and shape for all 3 stones. The ring is custom made in all ring sizes. Etching of a short name or message is possible inside the band. Let us know if you need a solid ring with no scooping inside the band. Large ring sizes or bands left without inside scooping, could require more metal weight. Who Is Kaisilver: We are the leading online provider of high end custom made jewelry from Thailand. Both gold and 925 sterling silver jewelry is crafted with the same standards related to, craftsmanship and gemstones. You can select designs from our website or, send us your design drawings or images. Since we have direct access to over 200 million carats of gems and connections with, all gem mining centers across the globe - we place no restrictions on your gem selection. The gems that you choose for your custom made jewelry order, need not be limited to what you see or read on our website. 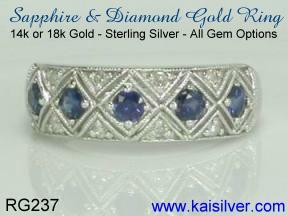 You can email our support experts at sales@kaisilver.com for any information related to jewelry and gems that you need. How To Buy: Since all Kai silver jewelry is high end and fully custom made, we do not encourage the, rush to 'click and pay' attitude. In our opinion, the buyer deserves more personal attention - this is something that our support experts at sales@kaisilver.com are always ready to provide. Let us know the details of your requirements related to metal, design, approximate ring size, gem options etc. Remember that, we can also craft fine quality jewelry based on your design ideas and concepts. Our team will provide necessary information for your guidance and might also, come up with some very useful suggestions. You will receive a price quote based on your requirements, continue to communicate with the team if any clarifications are required. You will then move to the next step and that would be to confirm your order with payment. We accept payment through Paypal and Western Union, bank transfers might also be accommodated based on your request. Paypal is generally a better option for first time buyers, considerother modes of payment only if Paypal is not available to you. Let us know which mode of payment you prefer and we will provide details for the same. The production time for Kaisilver custom jewelry is 4-6 weeks from the date that we receive payment. Shipping will be through FEDEX with web tracking, you will receive the tracking number the moment the parcel ships. 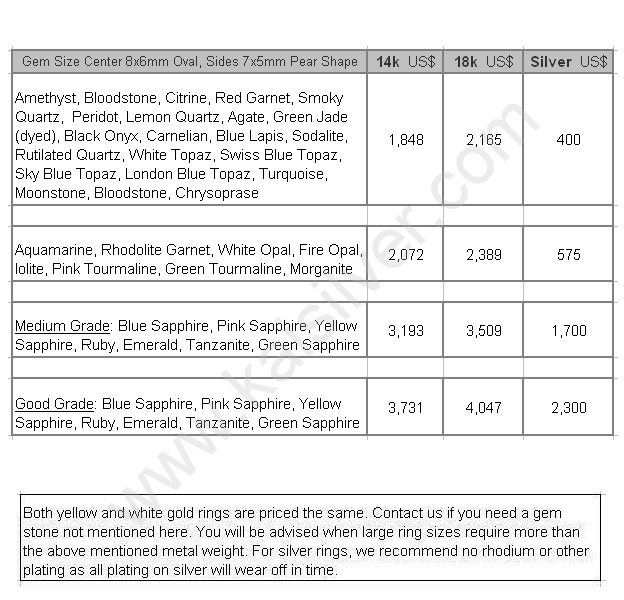 There is a shipping fee of 35 U.S$ that needs to be added to the price quoted in the table. Let us know if you wish to use a mode of shipping other than FEDEX and we will consider your request. An elegant sapphire diamond ring, can be ordered with a tapering band width or as, a sapphire diamond band with uniform band width all around. Available in gold and silver ... more. Handsome men's ring with fire opal and blue sapphire, you choose the gemstones for your ring and select gold or 925 silver as the metal. Custom made in all ring sizes, good weight ... more.